It’s not every day that a pair of nesting birds moves into the neighborhood. But that’s exactly what happened at Achieva’s 4th Street location in St. Petersburg! Back in 2014, a pair of beautiful osprey (also called sea hawks) built a nest on top of Achieva’s monument sign. Unfortunately, their nest, and the eggs inside, was destroyed during a storm. Undaunted, the couple returned to rebuild their home atop the sign. Fearing a repeat of the previous disaster, Achieva staff consulted the local chapter of the Audubon Society, which recommended that the nest be relocated to a safe and appropriate environment for the birds. Achieva then had a 50-foot pole installed on the property, and the Audubon Society ensured that the nest was safely transported to its new, permanent location. 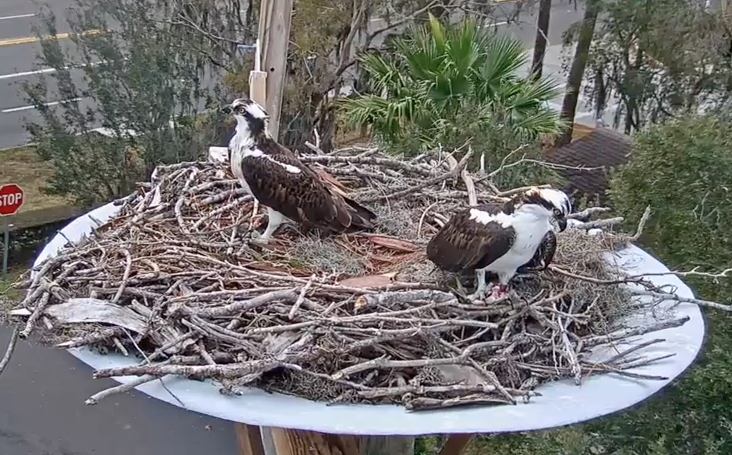 And now you can get a look at our Achieva Ospreys via the recently installed Achieva Osprey Cam! The osprey (Pandion haliateus) is a bird of prey, nesting worldwide on every continent except Antarctica. They can tolerate a wide range of habitats, but prefer to make their homes near bodies of water that supply fish, their primary food source. Known by numerous monikers, the osprey is also called the fish eagle, sea hawk, river hawk and fish hawk. Ospreys are medium-size birds, usually weighing between 2 – 4 pounds. The arched wings are distinguished by five finger-like feathers, and the wingspan can be as large as 70 inches. They have beautiful coloring, usually a dark, glossy brown on the top side and white plumage underneath. The females have a dark band across the chest, and are generally larger than the males, which tend to have a slimmer body and narrower wings. Young birds can be distinguished by the buff fringes on the wings and buff colored feathers on the underside. Nature has provided the osprey with some interesting adaptations to help it thrive. The bird’s eye sight is extraordinary – it can spot a fish from a height of 130 feet above the water. Dense, oily plumage helps prevent the feathers from becoming waterlogged as the sea hawk dives feet first and reversible outer toes and backward-facing scales on the talons help the osprey maintain a firm grasp on its slippery prey. The osprey nest is usually composed of sticks, driftwood, seaweed, and grass, and is almost always situated in an elevated location, including power poles, tall trees, inaccessible rocky outcroppings – and monument signs! The nest is typically renovated year after year by the same pair, who mates for life. In Australia, one documented situation revealed a nest that has been successively inhabited for nearly seventy years! At Achieva, it is our pleasure to provide a secure home site for this nesting pair, and it is our privilege to provide our community with a rare glimpse of nature’s glory via our Achieva Osprey Cam. You can get updates and more information on the history of this nest by following the Achieva Osprey Cam Facebook page. We hope you enjoy watching them as much as we do!